The outline map to the right displays Idaho's location in red. The State of Idaho is bounded by the Canadian Province of British Columbia on the north, by Nevada on the south, and by Wyoming on the east. Idaho is bordered to the northeast by Montana and to the southeast by Utah. The State of Washington lies to the northwest of Idaho, while the State of Oregon lies to the southwest. Idaho is the 11th largest state in the United States, and its land area is 82,747 square miles (214,315 square kilometers). Certain names of its forty-four counties are taken from native Indian tribe names, such as the Shoshone, Kootenai, and Nez Perce. This Idaho map site features road maps, topographical maps, and relief maps of Idaho. The detailed, scrollable road map displays Idaho counties, cities, and towns as well as Interstate, U.S., and Idaho state highways. The pannable, scalable Idaho street map can be zoomed in to show local streets and detailed imagery. to view a scalable Idaho road map. The detailed Idaho map and the regional Idaho map display cities, roads, rivers, and lakes as well as terrain features. The detailed map shows only the State of Idaho, while the regional map shows Idaho and the surrounding region. Idaho's capital city is Boise. Other populous cities located in southern Idaho include Idaho Falls and Pocatello. In 2005, the population of Idaho was estimated at 1,429,367, which is about 17.3 people per square mile. In 2010, Idaho's population rose to 1,567,582 people. The state's Interstate Highways include I-15, I-84, I-86, and I-90. Idaho is an invented name which has no known historical derivation. Northeastern Idaho is dominated by the Bitterroot Range of the Rockies, and the state's terrain is drained primarily by the Snake River, whose waters are used to irrigate crops and generate electricity. Idaho's natural attractions include Craters of the Moon National Monument, Nez Perce National Historic Park, and Sun Valley ski resort. For additional Idaho travel and tourism information, visit the Official Idaho Vacation and Travel Planning site and Idaho Atlas. This online Idaho reference map shows major cities, roads, railroads, and physical features in Idaho. 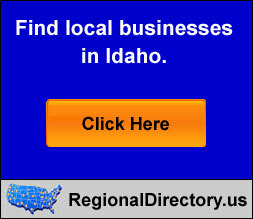 Several map publishing companies offer printed maps of Idaho. For example, Omni Resources offers several maps of Idaho that feature points of interest, airports, and parks, as well as selected local attractions and insets of major Idaho cities. Idaho-Map.org Editor, State Maps, PO Box 775, Barnegat, NJ 08005.